A hand saw is a carpentry tool, sporting a sharp toothed blade, most often used for cutting wood. The blade made of strong metal has a sharp edge which facilitates easy cutting of the relatively soft wood. While a mechanical saw is powered by a motor, which rotates to move the blade, the hand saw requires manual efforts. There are various types of hand saws, each beneficial for a particular cutting activity. Our Back Saw, sports a stiffening edge on its opposite side which is used for cutting, which gives a better control of the tool and thus facilitates precision in cutting. 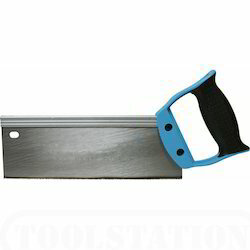 It is most often used for woodworking, such as cabinetry, which requires accuracy in cutting. The spacing between the teeth in this saw is very less. A major drawback of the back saw is that the stiffener being thicker than the blade, keeps the depth till which the saw can cut in limit. Some sub-types of back saw are tenon saws, dovetail saws and gent's saw. While tenon and dovetail saws sport a _pistol styled handle, either open or closed at the bottom, the gent's saw features a thin turned handle located parallel to the blade. Electric Chain Saw is a strong, manoeuvrable electric chain saw, ideal for work in the garden, for carpentry work, wood chopping, etc. Powerful 2000W motor producing 8,000rpm no load speed with an 800m/min chain speed. Fitted with a 0.15 secs chain brake. Built in safety guard and safety trigger in the soft grip handle. Supplied with 10m of cable, assembly tools and oil. Multi Purpose Body Saw produces burr free cuts without distortion. Ideal for body shop and sheet metal work. Cutting capacity of 1.6mm steel to 2mm aluminum. 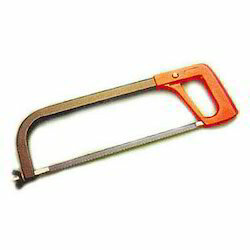 A Compass Saw, also referred to as a fret saw, is a narrow bladed saw, most often used to cut tight curves. 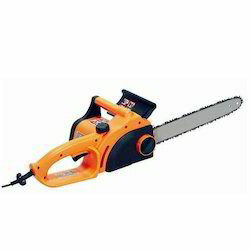 This saw can facilitate wood cutting in a relatively less radii, with a greater accuracy. 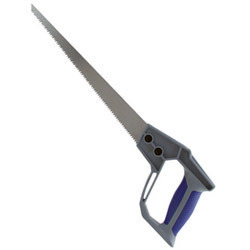 The design of this saw appears to be quite out of proportion, owing to the depth of its frame and comparatively a short blade. The blade used in this saw is very fine, and this proves to be the major advantage for the tool as it can cut sharp corners with definite ease. The only drawback of compass saw is the fragility of its blade. \A Hacksaw is a saw, featuring a fine toothed blade set under tension in a frame. 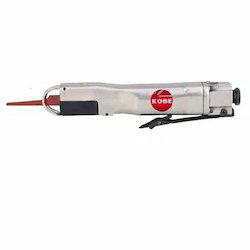 This powerful saw is often used to cut metals, such as aluminum and copper, other then wood. This saw sports a _pistol grip, and pins at the ends to attach a narrow blade. A screw is used in order to put this narrow blade under tension. This disposable blade can be either fixed facing towards, or facing away from the handle, depending on which the cutting action is determined on pull or push stroke.